Thai Beef Lettuce Wraps with Mint Dressing and Vegetable Slaw is full of fresh, crunchy vegetables and lively herbs! It’s the perfect meal to make when the mint hits the fan! First, tell me you’re not so young that you don’t remember the venerable daytime soap opera entitled “As the World Turns.” It was one of the greats that ran for 54 years on television! Are soap operas still even on? I used to watch them like crazy and know how addicting they are. Don’t need that in my life! We’ve had a house soap opera going on because of a flood from a frozen pipe that occurred in early January. It’s been interesting keeping a cat contained and calm with all the activity that’s been going on. This week we can begin to move back into our own home! We did a bunch of work today moving what could get moved back. It’s going to be Grand Central around here come Wednesday and everything is going to happen at once so doing a quickie post. Kinda like mint. It happens all at once! Mid-to-late spring is when my perennial herbs are at their best. We’re having an early spring here and mint is already popping its wonderful, flavorful little head out of the ground. When it gets going, there’s no stopping it. Mint is one of those things you plant only if you really mean it because it spreads like crazy! 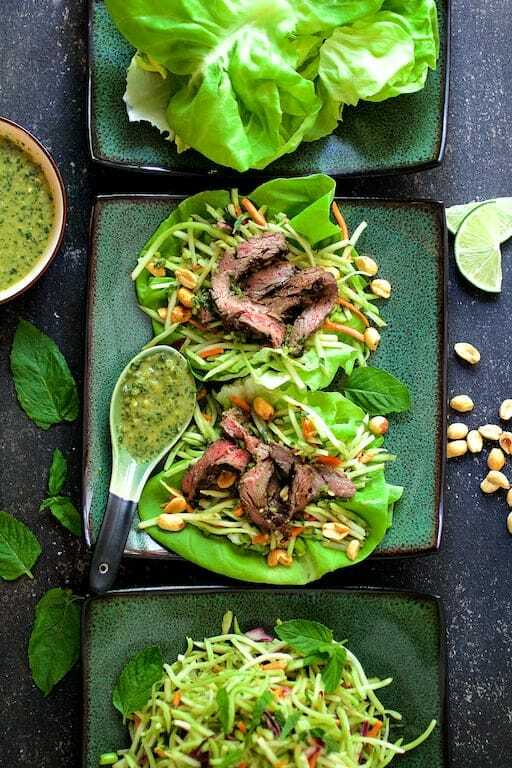 Instead, we love this Thai Beef Lettuce Wraps with Mint Dressing and Vegetable Slaw that enables us to use some of that bounty. 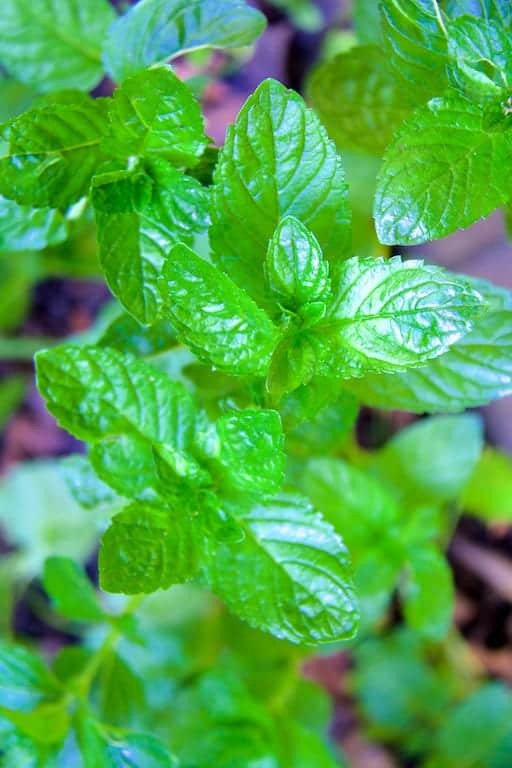 Along with cilantro and basil, mint is used frequently in Thai cuisine. 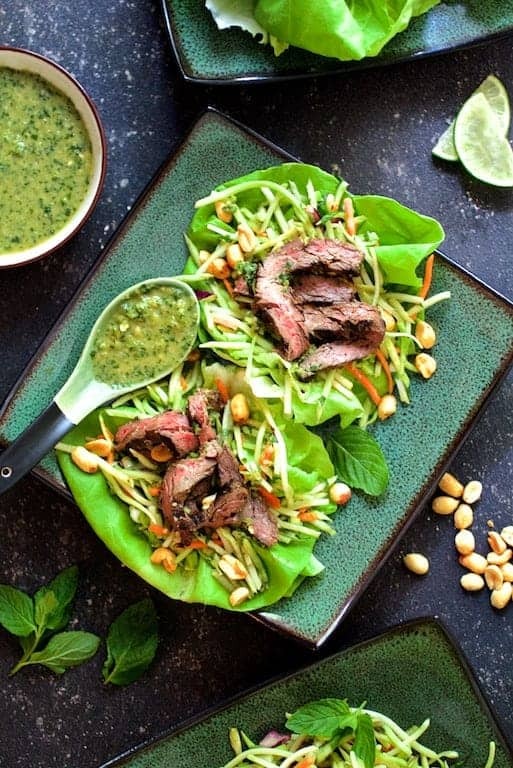 In these Thai Beef Lettuce Wraps with Mint Dressing and Vegetable Slaw, I used mint in the dressing and in the vegetable slaw for a healthful, fresh and light dinner for two. Feel free to use cilantro or basil instead if that’s what you prefer. This looks like a long list of ingredients, but the dish comes together fairly quickly. Because of the vegetable slaw, you don’t need much else on the side except perhaps rice. Skirt steak is one of my favorite cuts of beef for things like lettuce wraps, tacos and fajitas. Skirt steak takes very well to marinades because it’s thin. Other cuts such as flank steak may be used. However, a skirt steak is thinner than flank steak so it cooks faster and it’s easier to bite into in something like a wrap, taco or fajita. Let the beef marinate at room temperature while preparing the dressing and vegetable slaw. There’s no food safety danger for that short amount of time and the marinade is fairly acidic. Always let meat rest for several minutes before slicing for the juices to redistribute. Skirt steak should always be sliced against the grain. Let the mint (and the moving) begin! Be sure to try these other fresh and crunchy wrap recipes! Thai Beef Lettuce Wraps with Mint Dressing and Vegetable Slaw is full of fresh, crunchy vegetables and lively herbs! It's the perfect meal to make when the mint hits the fan! MARINADE: Combine marinade ingredients in a zipper-top bag. Add the beef and marinate at room temperature while preparing the dressing and slaw. DRESSING: Combine dressing ingredients in a food processor or blender. Process until smooth. Set aside. SLAW: Combine slaw ingredients in a bowl. Set aside. BEEF: Preheat a grill to medium-high. Remove skirt steak from marinade and discard marinade. Place the skirt steak on the grill, reduce heat to medium and cook 5 minutes per side or until medium doneness. Transfer beef to a plate, tent with aluminum foil and let rest 5 minutes. Slice the beef across the grain into thin strips. Serve in lettuce leaves, topped with slaw, dressing and peanuts. Serve lime wedges on the side. OH NO! Nothing is worse than water issues… (been there, done that!). Hope it gets resolved quickly…. this is one of those recipes I just love. Healthy meals…. but it still has amazing flavors. Pinned it to make soon! I used to also watch the soaps, awesome! yuck on the flood. Now the recipe, love it! The flavors are awesome and love the mint addition. I hadn’t realized that mint was common in Thai cooking – I’ll have to look at that! (And yours is so beautiful…) This looks like a great place to start! And good luck with the move back… Hope you get everything back to normal, soon.